This guide will show you how to print out information about the current user including the groups they belong to. If you want to show system information you can use the uname command. The id command will reveal all the information about the current user but you can also specify the name of another user. This will list just the group id such as 1001. You might be wondering what a primary group is. When you create a user, for example, fred, they are assigned a group based on the settings of the /etc/passwd file. When that user creates files they will be owned by fred and assigned to the primary group. If other users are given access to the group they will have the same permissions as other users within that group. The output from the above command will be along the lines of 1000 4 27 38 46 187. As mentioned previously a user is assigned to a single primary group but they can also be added to secondary groups. For example, fred might have a primary group of 1001 but he might also belong to groups 2000 (accounts), 3000 (managers) etc. You can also use the following syntax for viewing the secondary group ids. Displaying the group id is fine but as human beings, it is much easier to understand things when they are named. The output for this command on a standard Linux distribution is likely to be the same as the username. For example, fred. The output will be something along the lines of fred adm cdrom sudo sambashare. The output from the command will be something along the lines of 1000. The output from the above command will be something along the lines of fred. There is little point in supplying another user's name to this command. 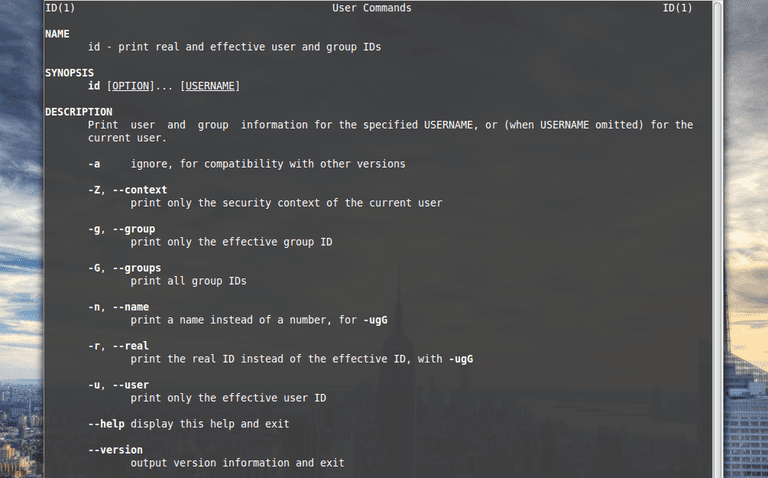 The main reason to use the id command is to find out what groups a user belongs to and sometimes to find out which user you are logged in as especially if you use the su command to switch between users. In the latter case, you can use the whoami command to find out who you are logged in as and you can use the groups command to find out which groups a user belongs to. The su command should only be used if you need to run a number of commands as a different user. For ad-hoc commands you should use the sudo command.